Try our new Knorr® Selects™ sides made without any artificial flavors or preservatives. 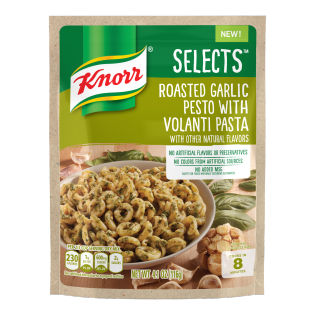 We won't mince our words, our Knorr Selects Roasted Garlic Pesto is absolutely mouthwatering. The aroma, the flavor, the creamy texture-- it's quite simply one of our favorite things to eat. We've paired it with basil and cheese. Roasted Garlic Pesto with Volanti Pasta is rated 3.9 out of 5 by 39. Rated 5 out of 5 by AnneinSD from Delicious Side Dish! I was pleasantly surprised while I was reading the ingredients during the preparation of the Roasted Garlic Pesto with Volanti Pasta. It's been a while since I have eaten a Knorr side dish, and I didn't know that the ingredients were so wholesome! No trans fats, no preservatives, no hard-to-pronounce chemicals. It was easy to prepare and it is delicious! This is a bold, flavorful selection, and I will put Knorr on my grocery list from now on! Rated 5 out of 5 by WorkerBee72501 from Restaurant quality at home! I've been a Knorr fan for years, but this variety was a pleasant surprise. It was flavorful but not overpowering. I dressed it up by tossing in some sauteed shrimp, and honestly you'd never know that it didn't come from a fancy restaurant. I highly recommend this product and will definitely be purchasing more! Rated 4 out of 5 by BabyBlueEyes449 from Tasty side dish Upon opening the package to put it in the pot we noticed that the smell of the product was very strong. We were hesitant about what it would taste like. After it cooked it smelled much better! Our 9yr old was the first to taste it and LOVED it! He kept saying "these are really good!" My husband and I both agreed. We were glad we gave them a try. I was provided this product for free to review. Rated 4 out of 5 by Rich from Quick and easy to make We have been using Knorr products for many years. This latest addition is tasty and convenient to store or cook. The only con was it took perhaps 5 minutes extra to cook the pasta. Now we know, we can time it's completion time with greater accuracy. It would also be nice if this pasta could be cooked in the microwave but it isn't a necessity.